Of all the questions a modern woman expects to be asked when meeting someone for the first time, “So, what does your husband do?” is not one that would’ve been on my radar. In fact, it would have grievously offended my pre-expat-wife self. What do you mean, what does my husband do? How is that relevant to who I am as an individual? How does his career, his role, his position – define me? And yet, after expat-wifing for 5 years now, it’s a question that no longer causes me to bat an eyelid. In fact, after being asked my name, my kids’ ages, where we live, my often-spoken, almost pre-rehearsed line about his position at X company dances at the tip of my tongue, waiting for its inevitable release. I am a dependant. I am someone else’s Plus One. I am so-and-so’s wife or so-and-so’s mother. The homemaker, the baby-caretaker, the healthy-toddler-muffin-baker. Today, you turn two years old. It’s been exactly two years since that day we met in that freezing operating theatre. I lay there, with your Papa standing in his chalk blue scrubs by my side, when, although numb from the waist down, I felt the exact moment they took you out and you took your first breath. Your first cry was moments later. And although it felt like an eternity at the time, in a couple of minutes they had wrapped you up in blankets and placed you in my arms. Hi readers! I wrote this article for the lovely team at Sassy Mama Singapore on play date “etiquette”. Thanks for sharing the love, you sassy ladies! When that precious little bundle of joy arrives into your life, the social building block known as “The Play Date” will become a regular feature on your agenda, mama. These little meet-and-greets of tiny humans and their respective caregivers tend to start happening once the shell-shock of your tiny human’s birth has worn off, and the first few weeks of what I like to call The Newborn Blur have…well…not passed, but have become an acceptable part of your outlook on the world. Your first play date will be many things: a little weird, a little new, a little “What exactly are we going to do?”, and more often than not, a little bit thrilling as you realise that this is one of the key ways you are going to survive this thing called parenthood. Is being a stay-at-home-mom enough? I’ve traded in my black business suits for shorts and maxi dresses. My shiny patent high heels for flip flops and mama Crocs. My chic over-the-shoulder handbag for a very practical, industrially-designed khaki backpack. My sleek updo for whatever hair arrangement is quickest to achieve, all the while accompanied by a halo of frizz framing my usually flustered face. I’ve traded in 10.30am cappuccino breaks with intellectual colleagues for a cracker and watermelon food fight with an energetic and gleefully squealing toddler. My 20-minute, quick-fix, power lunches for lengthy negotiations with a curly-haired little girl as to which non-carbohydrate items on her plate she will begrudgingly consume. My after-work conversations with my husband about current events and challenges I’m facing in the office for a rambling update as to how long the baby napped that day, the contents of her diapers, how tired I am, how sore my back is and seeking his take on whether oven pizzas would be okay for dinner. My billable-hour targets for hopes as to how many hours straight my child will sleep through the night. Get thee to a kitchen, stat. I know, I know, two blog posts in the space of less than two days: it’s a little ambitious for me, but hey. We’re stuck indoors again thanks to It Which Shall Not Be Named and Mama’s feeling like doing some [more] baking. 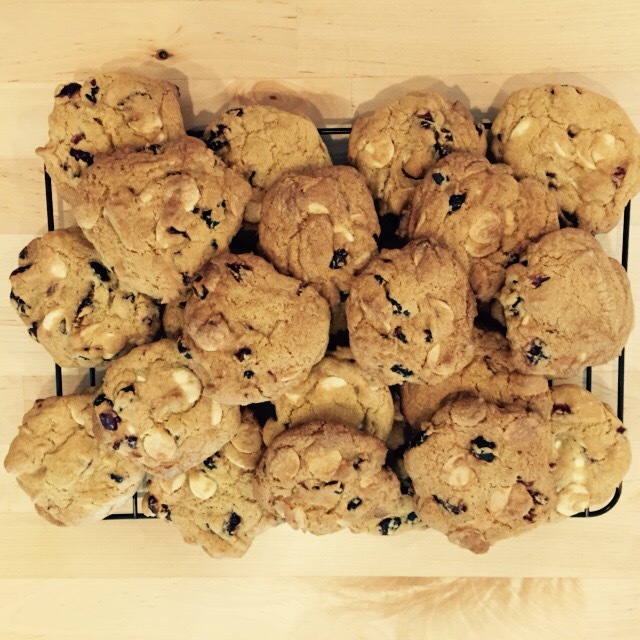 Today we’re baking one of my absolute favourites: white chocolate and cranberry cookies. Yum. Let me just put this out there right now: these are not sugar free; in fact, they contain two different kinds of sugar. These are not fat free. These are not low-carb, nor are they packed with any trendy ingredients like chia seeds or kale. I mean, they’ve got dried cranberries in them, so if you want to feel virtuous and buy the “Reduced Sugar” Craisins then you go right on ahead and do that. But gosh, just look at them. Aren’t they pretty? These turned out so yummy that I’m baking a second batch this afternoon once Her Highness awakens from her middle-of-the-day slumber. No, I haven’t gone into [very] premature labour and then accelerated time. However, today is my other baby’s (not Tuna, just her Chronicles) two-month blogoversary! Hurray! I can’t believe how quickly the time has gone by, how much I’ve already learned, how many fabulous people I’ve met through blogging and how exciting the world of opportunities that has opened up to me is turning out to be! But wait, there’s more! For more posts, LIKE the Tuna Chronicles on Facebook! I feel like one of the most under-advertised aspects of parenting is the part when illness strikes. I'm sitting here with a snot-stained shirt and "it's-too-good-to-be-true" paranoia while the little ones take simultaneous naps as I'm cautiously waiting for the next bout of coughing to abruptly end someone's 12-minute stretch of sleep. That's where I disappeared to over the last week or so - far, far into the vortex of saline sprays, nebulisers, expectorants, and corticosteroids. Multiple doctor visits and X-rays and blood tests. This has not been good for my germophobia. My kids getting sick is one of those things that really makes me doubt my success as a mother. You had ONE job, lady. Keep them healthy and happy. They were neither at several points throughout the last couple of weeks. I should've sanitized their hands more. I'm not hygienic enough. No. But wait. Antibacterial is the devil buzzword now - superbugs and all that. I'm TOO hygienic. I need to let them play in the dirt more. Eat dirt. Be one with the dirt. Oh. But the air quality is garbage outside. They'll breathe in all those nasty PM2.5 particles. Wait but what about the pollutants INSIDE our home? Omg I'm switching to vinegar cleansers. Maybe we should move countries. They need more probiotics. It's because we don't always eat organic. All those pesticides and heavy metals. They see too many other kids and keep picking up bugs. They don't see enough kids so their immune systems aren't tough enough. They really need more probiotics. Ah, I didn't breastfeed the older one for long enough, that's why. I should make more of an effort to quarantine the little one from her when she's sick. Yeah right. It's an exhausting mental dance. A tango of reality versus my shoulda-coulda-wouldas. Guilt, guilt, guilt. Wishing I could take their place even if it meant I'd have to go through double, triple, a hundred times the suffering. The girls are fine now, for the record. By publishing this on the internet I'm essentially doing a rain dance inviting the next sleep regression into my home but Puff slept a 4.5-hour stretch last night so I'm hoping that's the tail end of all this. Until next time.